Fleet nameAntares Cruise International Ltd.
Antares is a small boat with a total of 3 cabins. she will suit the best for families and friends. built from ironwood that ensures liability. Small capacity guarantees you will get a personal care and attention. The boat can accommodate up to 6 passengers in 3 cabins. All rooms have a double bed that can be converted into twin beds, so it will suit either for twin share or for double occupancy. All room has a private bathroom and airconditioning. Time in between dives can be spent on the upper deck under the sails. Antares equipped with a brand new compressor, nitrox mixer. Due to high crew and quest ratio with a total of 3 divers to 1 dive guide you can be sure you will get a personal attention and quality service. Boat equipped with GPS, Radio, life rafts and jackets, firefighting equipment, emergency oxygen, first aid kit. 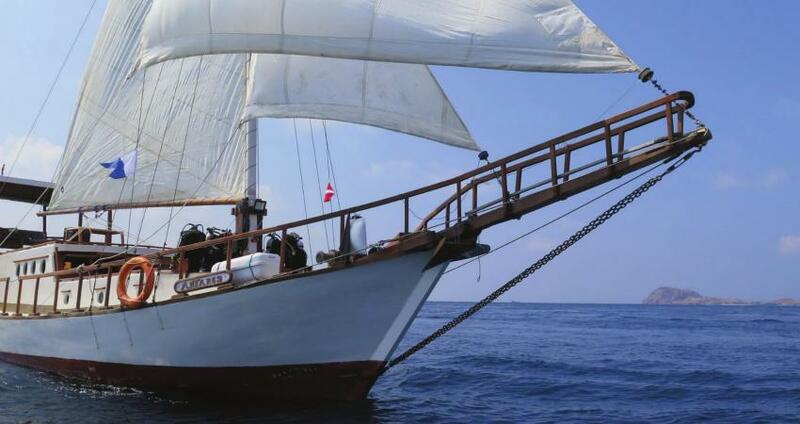 Diving itineraries include two of main Indonesia itineraries Komodo and Raja Ampat. Both of this destination famous for macro diving. Pygmy seahorses, tiny octopuses, shrimps, and many others can be found in corals here. These regions also are known for the great variety of marine creatures. You can see sharks, tuna, mantas, dolphins. Myself and 3 friends had the pleasure of being aboard Antares for 10 days in May 2017. This well appointed yacht is fully equipped. We were well looked after by her guide and crew and saw as much of the national park as possible. Tanks were ready every time, currents and dive plans backed by knowledge and experience. 3 dives a day every day. Great and fresh food at every meal. Perfect downtime between each dive and the locations were second to none. Antares is a fantastic diving boat - Comfortable, Friendly, Food, Fun, Dive sites, Night dives...you name it they have it. I grabbed a great bunch of photos and if I could post them in here I would. Get on board and enjoy.